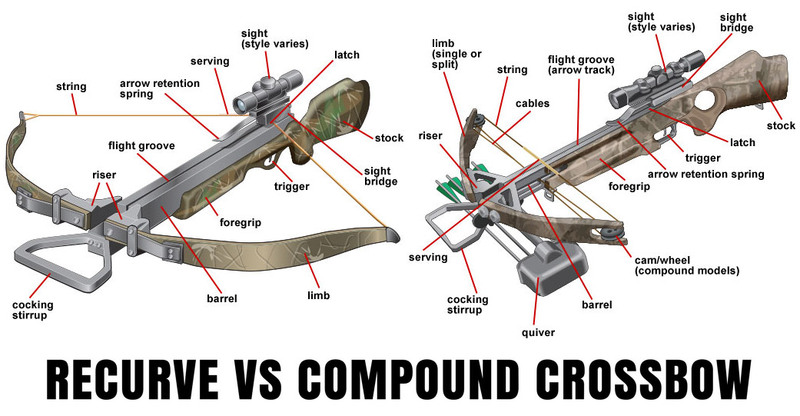 →Recurve vs Compound Crossbow: What is the Best Crossbow for Hunting? Recurve crossbows often have a simpler design as opposed to compound crossbows. There are no complicated mechanisms, and you won’t really need any special tools to restring it. Because of this, I find that the recurve is simpler to operate and hence more reliable on the hunting grounds. Crossbows have different weights and sizes to suit every hunter’s preferences, but I generally find that most compound crossbows tend to be heavier than recurve ones. While this may not seem like an issue at first, you will most likely feel the difference once you’ve been carrying your crossbow for hours on end. I know from personal experience that compound crossbows are more powerful than recurve crossbows, especially in terms of arrow penetration. This is mainly because compound crossbows have faster bolts, allowing them to shoot arrows more quickly. I owned a compound crossbow in the past, and I noticed that it wasn’t as durable as my current recurve crossbow. My guess is that because the compound crossbow has so many parts, there may be a bigger chance that something may break off if you drop the bow from a particular height or expose it to harsh weather conditions. On the flipside, all of my recurve crossbows have generally lasted longer than my compound one, even when I’ve accidentally mishandled them at times. You don’t need to do a lot in terms of maintenance on a recurve crossbow because it has fewer moving parts. As I’ve already mentioned, you won’t really need any special tools to restring it, which may be important if you find yourself doing that very thing in the middle of your hunting grounds. A compound crossbow, on the other hand, needs constant maintenance because it has so many moving parts. These parts wear out with constant use, so you may find yourself spending more time and money on maintaining this type of bow. I know from personal experience that recurve crossbows tend to be quieter than compound crossbows, although not really by much. When I was just starting out, I’ve had times when I’d miss a good whitetail because my compound crossbow was just too loud! Later on, I’ve learned to choose a crossbow that is silent, and I’ve discovered that a recurve crossbow wins in this category. If you prioritize arrow speed and power over anything else, then a compound crossbow may be the better choice for you. Recurve crossbows tend to be weaker in terms of power because of the way they are designed. When looking at compound crossbows, you may want to check their bolts because they help determine the bow’s arrow speed. Don’t be afraid to consult a store representative if you’re not sure! A hunting bow needs to be as quiet as possible so you don’t end up alerting the game of your location. Recurve bows are generally more silent and would perform better in very quiet hunting grounds, such as areas deep in the woods. I normally dislike heavy crossbows if I need to take long hikes in a forest. However, heavy crossbows tend to steadier and may allow you to shoot with more accuracy. Consider your logistics and how often you may need to move before deciding which bow to bring to your hunt. Both the recurve crossbow and the compound crossbow have their own advantages and disadvantages. Most hunters I know prefer the recurve because it is generally lighter, quieter, and simpler to use. You don’t also need to do a lot of maintenance on it, and it is usually more durable than the compound kind. While I personally like to use a recurve crossbow better than a compound one, you should still consider what you want to prioritize before making a purchase. Remember: Recurve crossbows may be lighter and more silent, but compound crossbows may be faster and more powerful. Did this article help? 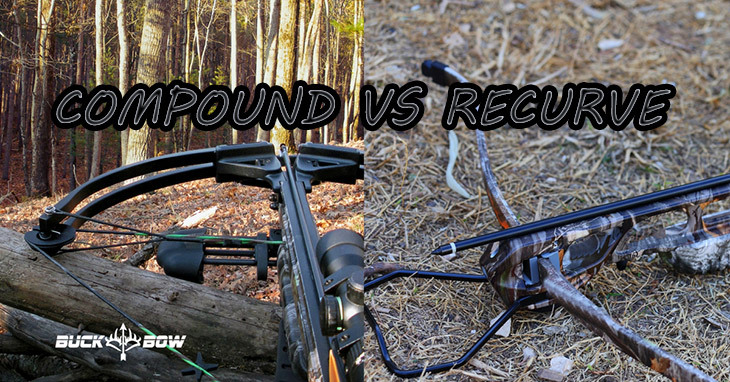 Which type of crossbow do you like better: the recurve or the compound? Let me know in the comments’ section below. Happy hunting! Crossbow vs Gun – What Makes The Best Survival Weapon? On Shooting Skills: What Is The Effective Range Of A Crossbow? How Long Can You Leave A Crossbow Cocked?